The term voice changer software, which also been known as voice enhancer or voice morpher, refers to a computer software program with advanced algorithm developed for altering a person's voice to either make them sound like someone else or to disguise their voice (e.g., male to female, female to male). This tutorial will guide you on how to change your voice with Voice Changer Software 8.0 Diamond quickly and easily. You may find the program icon right at the Start Menu's quick-start list (1). 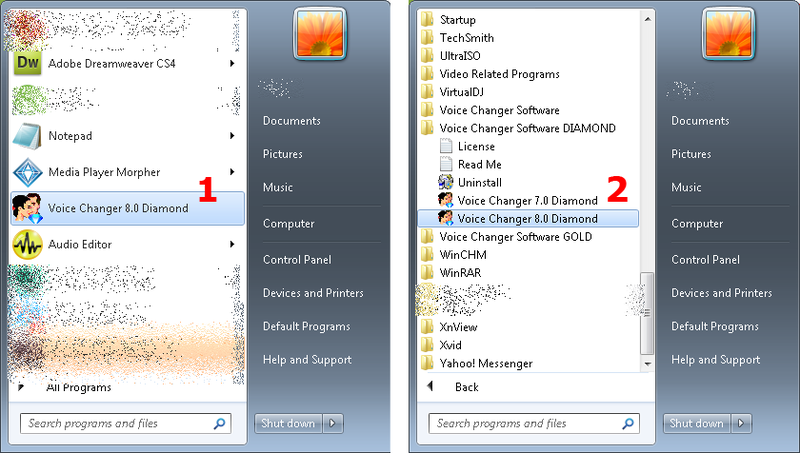 Other, you can browse for it under folder Voice Changer Software Diamond as per illustrated in the image below (2). 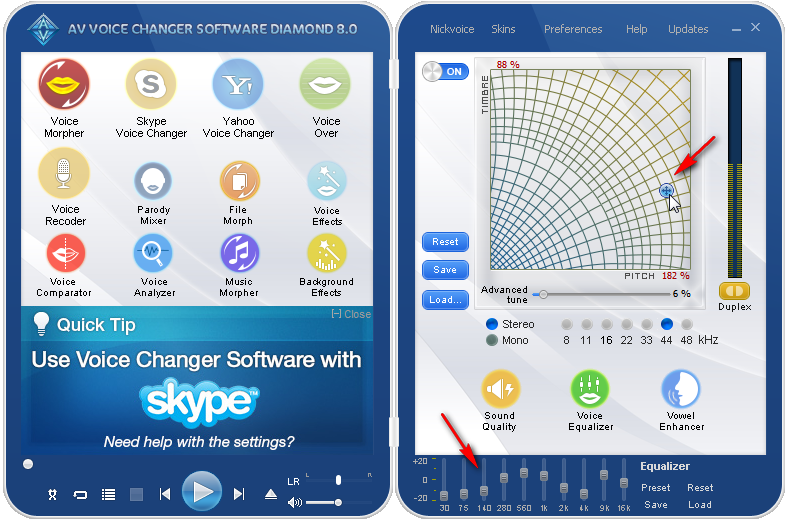 More than 60 pre-set voices come with Voice Changer Software 8.0 Diamond are ready to use. They are also known as "nickvoice" and can be accessed easily via the Nickvoices menu. Just, within in the main program panel, hit the Nickvoices menu, hover mouse over For male input voice to explore its sub-list of nickvoices to select. Then select any voice you like best (for example, Pleasant girl). This action will immediately help to change your voice from that of a male to that of a female. Within the Pitch & Timbre graph, the pointer has been relocated right after you select a nickvoice from the Step #2. This may be the best settings for somebody's voice, but not for you (everyone's voice is characterized on pitch and timbre). So, if you see that the voice quality is not as good as you expect by listening to your changed voice when speaking into the microphone, you can always make change to the timbre-pitch pointer still getting your desired voice. **If you do not hear your voice changed, make sure that the Duplex button is ON (yellow ). This tutorial is useful for changing one's voice to different gender no matter what the original voice e.g., female to male or male to female voice. It can be also used for making prank calls with your friend on i.e, Skype, Yahoo, Trillian, any VoIP programs and in-game voice chat system. However, I want to modify my voice and the microphone output, so as to disguise my real voice. I don't have any security issues, I just don't want my IRL friends to recognize its me playing when they hear my voice. So you guys know any voice changing software that works immediately? Check your audio driver for settings. I think most realtek drivers include an voice morphing feature. Voice changer software is a software voice changer that let's you choose how your voice is altered so the input from the hardware links up with the software in order to make your voice difficult to de-crypt.